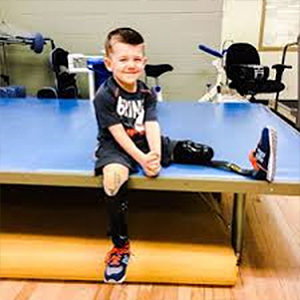 Jude was only 3-years old when he lost both of his legs as the result of a lawn mower accident. This young, vibrant boy, the middle child in a family of five kids, could no longer run and play with the same relentless energy – and he couldn’t keep up with his siblings. His parents were struggling with the fact that, on their own, they could not afford the more advanced, customized prosthetics that Jude needed to achieve the same level of activity he’d had before his accident. Along with Scheck & Siress in Chicago, HAF provided Jude with two high-tech Blade Running Feet and two running socket prosthetics which will increase his mobility and agility while playing sports; something that Jude figured out only 2 minutes before he was zooming up and down the hallways! His dreams of competitive sports is even more of a reality now; and since he recently won five track and field gold medals at the 2016 UCO Endeavor Games, we feel fairly certain you’ll be seeing much more of him on the competitive circuit.